In his Bain years, the GOP nominee helped fashion Monsanto into a biotech giant. 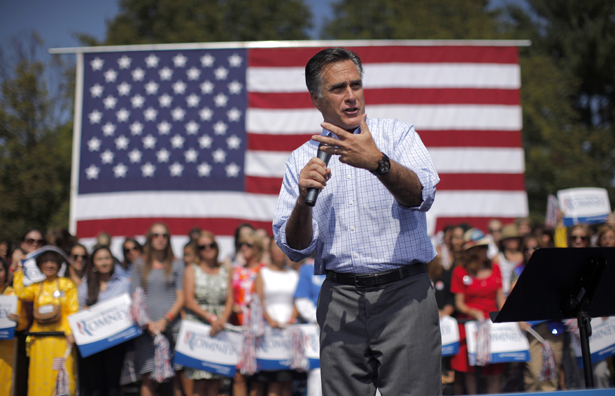 What would the notorious purveyor of genetically modified foods get from a Romney presidency? This history matters not just because of the light it sheds on Romney’s self-ballyhooed business experience but because of the litany of Monsanto corporate objectives that clash with planetary concerns. If Romney is elected, this bête noire of environmentalists will have a very old friend in a very high place. The romance between Romney and Monsanto began back in 1977, when the recently minted Harvard Law and Business School graduate joined Bain, the Boston-based consulting firm launched in 1973, the same year Monsanto became one of its first clients. One of Bain’s founding partners, Ralph Willard, described to the Boston Globe in 2007 how “Romney learned the technical aspects of the chemical business so thoroughly that he sounded as if he had gone to engineering school instead of business school,” and that Monsanto executives soon began “bypassing” him to go directly to Romney. A year before Romney began to work with Monsanto, Congress passed a 1976 bill banning PCBs, a liquid chemical monopoly of Monsanto’s, exposing the company to an onslaught of litigation throughout the Bain years. Monsanto was also besieged by charges that its decade of Vietnam War defoliation with Agent Orange dioxins—branded by a Yale environmentalist “the largest chemical warfare operation” in human history—had contaminated as many as 10 million Vietnamese and American people, leading to a $180 million settlement covering the claims of 52,000 troops in 1984. The first Monsanto biotech product, bovine growth hormone, became another headache for the firm, crippling cows, alarming parents concerned about the health effect on kids, meeting with rejection among developed countries outside the United States and sparking bans by American retailers from Starbucks to Walmart. Monsanto announced it invented the hormone in 1981, midway through the Bain period, but didn’t get FDA clearance for it until 1993. By 2008, the company got out of the business altogether, ostensibly selling it for far less than it invested in the technology. Now the king of GM corn, soybean, alfalfa and other seeds, engineered to resist Roundup and increase yield, Monsanto is awash in global disputes, having lost two recent, at least $2 billion, court decisions in Brazil, for example, where 5 million soy farmers sued them. The Brazilian farmers’ issue is also a source of frustration for US farmers—the contracts farmers are forced to sign pledging not to save seeds for future harvests, a common farm custom that resale-fixated Monsanto has hired a seed police army to stop. While Monsanto can trot out its own and FDA findings to support its seed safety claims, there are independent studies linking its corn to organ damage, obesity, diabetes and allergies. The company’s profits plunged in 2010 as evidence mounted that GM seeds, 90 percent of which originate with Monsanto, weren’t boosting yields as promised. Consumer resistance has already forced Monsanto to retreat from the GM potato, tomato, wheat, rice, flax seed and bio-pharmaceutical crops. Peru recently banned GM products for ten years and Hungary destroyed all its Monsanto cornfields, joining ninety countries that aggressively monitor and restrict, or ban, GM imports, according to the Center for Food Safety. The Union of Concerned Scientists criticized the absence of independent and long-term research findings on GM safety, charging that we are placing “a huge wager” on this little-examined technology. Monsanto’s onetime communications director shrugged his shoulders to this kind of concern, telling the New York Times: “Monsanto should not have to vouchsafe the safety of biotech food. Our interest is in selling as much of it as possible. Assuring its safety is the FDA’s job.” In fact, Monsanto pressured the Reagan administration, starting during the Bain years, to develop a friendly regulatory framework it could exploit as a seal of approval. Roundup Ready seeds, of course, are inextricably tied to the success and safety of Roundup itself. But “super-weeds” are developing a Roundup tolerance, requiring more and more spraying to work, which is harmful ecologically and financially damaging for farmers. Introduced in the Bain years with Bain boosting, Roundup’s supposedly “biodegradable” and “nontoxic” claims have led to false advertising findings in France and by the Attorney General of New York. Studies are also now beginning to link Roundup to cancer and birth defects, the first indication that it may be going the way of Lasso, another Monsanto herbicide endorsed by Bain that was forced from the market because of health hazards. During the presidential primaries this past March, Romney named an eleven-member Agricultural Advisory Committee that was packed with Monsanto connections, including its principal Washington lobbyist Randy Russell, whose firm has represented Monsanto since its founding in the 1980s and has been paid $2.4 million in lobbying fees since 1998. Among those also appointed to the panel were another Russell client and Monsanto partner in the marketing of GM alfalfa, Land O’ Lakes CEO Chris Policinski; and Chuck Conner, whose National Council of Farmer Cooperatives (NCFC) is closely linked to Land O’ Lakes. Conner and Policinski, an NCFC director, publicly supported Monsanto’s 2010 attempts to win USDA approval for its alfalfa. Other members of the initial Romney council were Tom Nassif, whose Western Growers Association receives annual grants from Monsanto, and A.G. Kawamura, the former California agriculture secretary who championed Monsanto’s alfalfa despite a federal court ruling in the state against it. Romney has also cultivated close relations with three Republicans who hail from Monsanto’s home state of Missouri—Senator Roy Blunt, former governor Matt Bluntand former senator Jim Talent. In 2011, Romney picked Roy Blunt to be his campaign’s point man in the Senate and named Talent to his four-member economic policy team. Matt Blunt, son of the senator, became a senior adviser at Solamere Capital, the investment firm headed by one of Romney’s sons. (Roy Blunt’s wife Abigail, a Romney bundler, is the in-house lobbyist for Kraft Foods, also represented by Russell and a sometimes ally of Monsanto’s on key food issues.) Monsanto, its spinoff Solutia, and Russell’s firm have long been top donors to the three, contributing a combined $246,170 to them over the years (Monsanto executives are modest donors to Romney but give nothing to Obama). Katie Smith, a Talent aide for four years who was director of Missouri’s agriculture department under Governor Matt Blunt until 2008, was also named to Romney’s council. Smith is now director of public affairs for Osborn & Barr, a Missouri-based public relations firm created by Monsanto executives whose founding client was Monsanto. Matt Blunt was such a champion of Monsanto’s GM products that its CEO presented him with the annual leadership award of the Biotechnology Industry Organization, a Monsanto-backed group. Talent is the co-chair of a Washington lobbying and strategic advice firm whose clients include Land O’ Lakes and was once a partner in a Missouri lobbying firm that represents Monsanto now. Nebraska senator Mike Johanns, a beneficiary of $9,500 in Monsanto-related contributions, was selected by Romney to co-chair the advisory group. Johanns was George Bush’s agriculture secretary in between his six years as Nebraska governor and three years in the Senate. In 2002–03, he headed two associations of governors, one of which included Romney, and went abroad to push GM foods and assail European Union efforts to require labeling of them. While Johanns ran USDA in 2005, it approved Monsanto’s alfalfa without obtaining the minimal environmental impact statement required under Reagan’s regulatory framework, a decision overturned by the federal courts. Johanns’s agency did the same for Monsanto’s sugar beets. Johanns and Blunt joined all but one Republican in the Senate, and many Democrats, in defeating Bernie Sanders’s bill amendment this year to require GM labeling—disclosure that’s favored by more than 90 percent of polled Americans, the food safety arm of the United Nations and sixty-one countries. Monsanto has so far spent $4.2 million to defeat a labeling referendum on the ballot in California this November, more than any other opponent, and several of the organizations connected to members of Romney’s advisory council have also opposed the referendum. President Obama supports a labeling requirement, though he’s done nothing to make it happen, while Romney’s campaign declined to respond to The Nation’s questions about his position on labeling or the California referendum. Romney won’t answer our questions, or anyone else’s, about where he stands on the two pending farm bills—the Senate version backed by Obama that passed with overwhelming bipartisan support (including Johanns and Blunt), or the House bill that made it through the agriculture committee with two Republican amendments dubbed “Monsanto riders.” Having lost the alfalfa and other GM lawsuits, Monsanto spent more on lobbyists, including Russell, than any other non-tobacco agribusiness and convinced House Republicans to add these riders, which would virtually immunize its products from regulation, allowing farmers to plant crops even if a court has ordered an environmental review and short-circuiting the reviews, as Johanns tried to do. Congressmen Jack Kingston and Frank Lucas, each of whom sponsored a Monsanto rider, were listed in August as national co-chairs of a new general election committee called the Farmers and Ranchers for Romney coalition, which also includes all eleven members of the March group and Roy Blunt. Johanns, Conner and Nassif are among the six National Chairs of the group, as is Romney’s recent Iowa tour guide Bill Northey, the elected agriculture secretary whose biggest donors include Monsanto ($12,000). In a hotly contested 2010 race, Republican Northey was backed by Democratic lobbyist Jerry Crawford, whose firm made almost $1 million as Monsanto’s top Iowa-based lobbyist. The Romney coalition also includes John Block, Russell’s mentor who appointed him deputy secretary when Block was Reagan’s agriculture secretary in the ’80s and now hosts a national radio show that’s sponsored by Monsanto and features denunciations of Monsanto opponents as “environmental wackos.” The president of the United Fresh Produce Association and the past president of the National Pork Producers Council—two other Russell clients and Monsanto allies—are also part of the Romney group. And the list includes the past head of the American Soybean Association, which backed Monsanto’s riders to the farm bill; and Steve Troxler, North Carolina’s agriculture commissioner, who collected $3,000 in Monsanto contributions, grows GM soybeans (probably Monsanto’s) on his own farm, and sponsored a bill to stop counties from banning GM foods. Another coalition member, Jay Vroom, heads a Monsanto-funded, aggressively pro-GM trade association of pesticide makers called CropLife America, a large donor to Kingston and Lucas. The two top directors of CropLife’s regional partner in St. Louis e-mailed associates that they “shuddered” when they learned that Michelle Obama was planting an organic garden on the White House lawn, writing her a letter suggesting that she was impugning chemical agriculture. Monsanto itself has been coy about Obama, especially after he appointed its longtime ally former Iowa governor Tom Vilsack as agriculture secretary. Unlike his USDA predecessor Johanns, Vilsack put Monsanto’s alfalfa through a court-mandated EIS process, but then deregulated it entirely. Close to Monsanto lobbyist Crawford, Vilsack has also partially deregulated sugar beets. As deliberately vague as Romney is, he’s moved publicly in Monsanto’s direction on the company’s genetically engineered ethanol and farm subsidies, appears aligned with it on labeling, and his spokesman Shawn McCoy said this month that the candidate was “concerned by the effect that the Obama administration’s crushing onslaught of regulations is having on agriculture,” a suggestion that he might favor the regulatory relief in the Kingston/Lucas riders. Frank Reining, the Monsanto executive who was designated by Hanley in 1973 to interface with Bill Bain and his partners, says Bain’s “relationship with Monsanto” began “before Bain even existed,” noting that it was among the firm’s first and biggest clients. Patrick Graham, a Bain founder, agrees that Monsanto was an “early client,” soon delivering millions in annual fees. According to Reining and eleven other former Monsanto and Bain executives interviewed for this article, Bain took a companywide approach to its restructuring of Monsanto, focusing over the succeeding years on one product after another—“confirming,” as Reining put it, the corporate consensus to get out of polyester, plastics and synthetic fibers. Dan Quinn, another former partner recruited at Bain by Romney in 1983, called Monsanto a “prized” client that Bain “thought of as one of their biggest successes.” Romney, says Quinn, was “a key framer “ of the continuing conversation with Monsanto, especially “on the marketing side,” where he was “in charge of several of those teams,” just a notch below the Bain founders in the chain of command. Combined with Graham’s analysis, this would make Bain, and consequently Romney, the doctors whose surgery eons ago is responsible for the Monsanto we know today, a financial giant whose biotechnology products are enormously controversial all over the world. Research assistance was provided by Danielle Bernstein, Loretta Chin, Alina Mogilyanskaya, Joseph O’Sullivan, Nadia Prupis, Stephanie Rogan and Elizabeth Terry. Wayne BarrettWayne Barrett is a Nation Institute Fellow who has been covering the presidential election for the Daily Beast and Mother Jones. He was a senior editor and investigative reporter at the Village Voice for nearly four decades, and has written several books, including Rudy! An Investigative Biography of Rudy Giuliani.